Even someone who isn't a birder can tell that this is a duck of some kind. 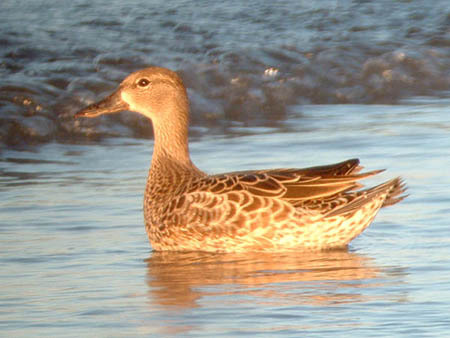 The largely brown plumage with pale edgings to the body feathers suggests a female, immature, or eclipse male dabbling duck. Most female type dabbling ducks can be identified by bill shape and color and face pattern. The bill of our quiz bird is mostly dark, which rules out Mallard, Mottled Duck, American Black Duck, Gadwall, and Northern Shoveler, all of which have orange, yellow, or green in their bills. A Northern Shoveler would also have a more spatulate shaped bill than our quiz bird. American and Eurasian Wigeon have bluish bills with dark tips. Northern Pintail has a blue or gray bill with a contrasting dark culmen and a plain brown face. A Green-winged Teal would have a darker face and wouldn't show the pale eye arcs of our candidate. That leaves Garganey, Cinnamon Teal, and Blue-winged Teal to consider. A Garganey would show a prominent dark line on the face below the eye; there is no such mark on the face of our quiz bird. Female type Blue-winged and Cinnamon Teal can be very difficult to separate, but a Cinnamon Teal would have a longer bill, plainer face, and warmer overall plumage. This Blue-winged Teal was photographed at Montrose Beach in in Chicago on August 21, 2006.